The railroad is housed in a 24' x 36' brick veneer building, the interior of which was recently constructed and completed. Except for a small workshop and restroom, the layout itself commands the entire interior space. The building has central air and heat, and is well insulated. Walls and ceiling are of gypsum board, and the floor is covered by a high-grade, tightly woven commercial carpet. This provides a comfortable and quiet atmosphere for the railroad. 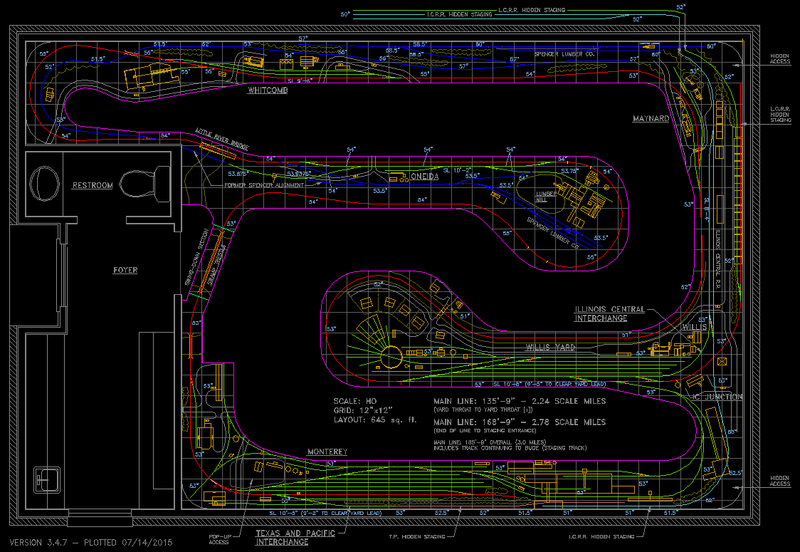 Shown is the most recent version of the track plan. The mainline is represented by the red lines, the passing sidings, yards and industrial trackage are in green, and the logging operation is rendered in blue. The cyan-colored track belongs to the connecting railroad, the Illinois Central (running across the right side of the plan), and the pink is the Texas and Pacific (shown entering the Monterey yard at the bottom). The dashed lines outside the plan represent hidden staging trackage located behind the scenery at each location. This particular scheme yields a 136' mainline...equal to 2.24 scale miles. The railroad line begins at Monterey, the town at the lower left. It proceeds northeasterly and goes through Oneida, Whitcomb, Maynard, then Willis (located in the right-hand peninsula). The line continues to hidden trackage at the right, representing its continuation to the town of Bude. One particularly noteworthy feature on this plan is the loads-in/empties-out configuration at the bottom right. This will service two industries at the Willis end -- a plywood plant, and pulpwood loading yard. The plywood plant will ship plywood in boxcars and wood chips in special hoppers. The Monterey end will receive the pulpwood and chips at a paper products plant. The woodrack (pulpwood) and woodchip hopper cars will be used in the loads-in/empties-out scheme. The logging operation will be featured on an upper elevation at the center and top. The line will wind down, cross the Little River on joint trackage, then terminate at the mill, which will feature a log pond for unloading the freshly cut timber. If you've been following this track plan for any length of time, you've likely noticed literally dozens of changes through the various versions. Since benchwork and track laying has commenced, I'm giving some last looks to the plan to get it as "final" as is reasonably possible. Yes, I know there will be necessary changes during construction. But changes are easier on paper than in the field, so I've strived to work out as many bugs as possible. Click here to view the Adobe PDF version of this plan, which allows you to zoom and pan for a better view. The latest version now has the 12"x12" grid imprinted. Also, here is a PDF file for a slightly older version of the plan. Mozilla-Firefox users please note that the PDF viewer plug-in is flawed in the older viewers, and you may have to configure the browser to use the full reader instead. Don't have a reader for PDFs? Click the image below to download a free copy of Adobe Reader software.